KAHULUI — Ten years plus eight. 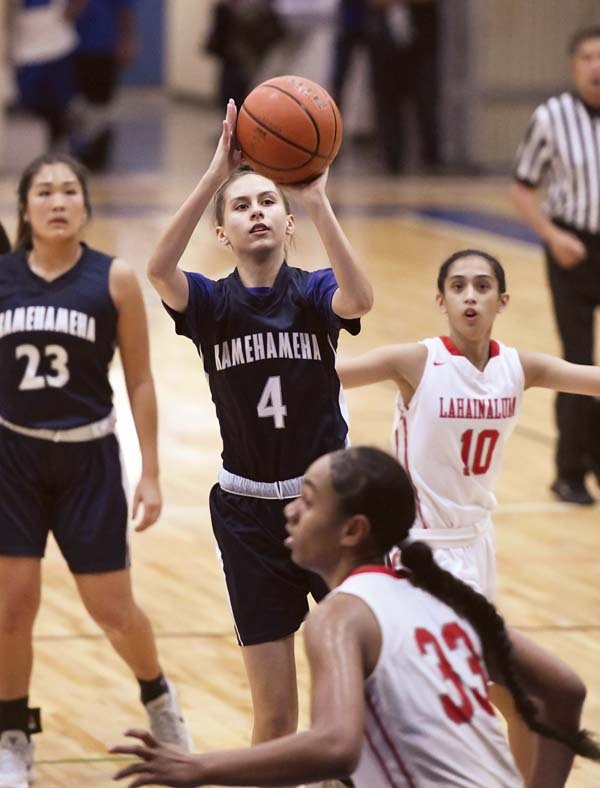 The Lahainaluna High School girls basketball team rang up its 148th straight Maui Interscholastic League Division I win in a row, 50-28 over Kamehameha Maui in the MIL tournament final at Shine Matsui Athletic Center on Tuesday night, nailing down a 14th straight league crown in the process. The winning streak spans 10 unbeaten seasons, plus eight more victories. The Lunas (14-0) have a class of seven seniors — Sheilaika Agbayani, Rachael Balagso, Braeanna Estabillo, Keiko Aotaki, Kayjan Pahukoa, Maalaea Kaneaiaakala and Tori Tihada — who finished 56-0 in their MIL careers with yet another convincing victory. 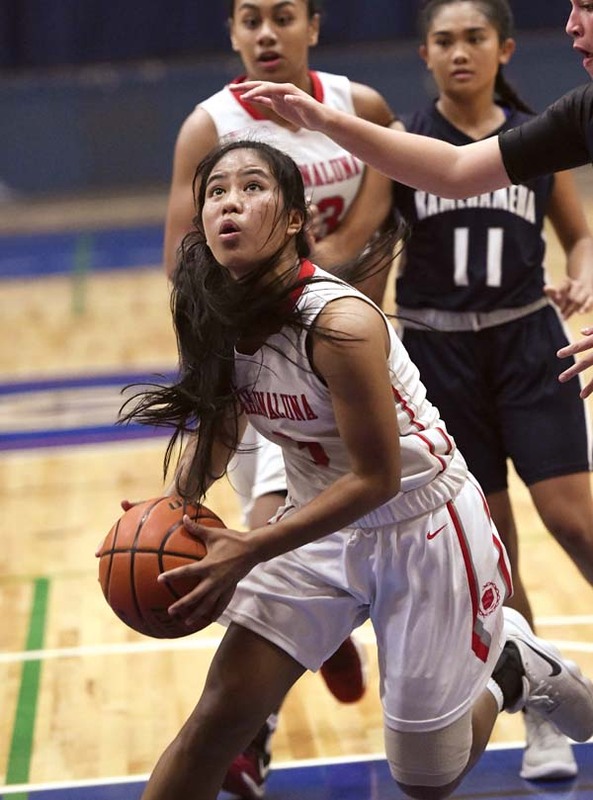 Rachael Balagso of Lahainaluna looks to the basket in the second quarter. Lahainaluna coach Todd Rickard smiled as he watched his team receive their gold medals — he has guided the Lunas to eight of the last nine state final fours. This group of seniors will not be soon forgotten. Now, a state title is the goal. 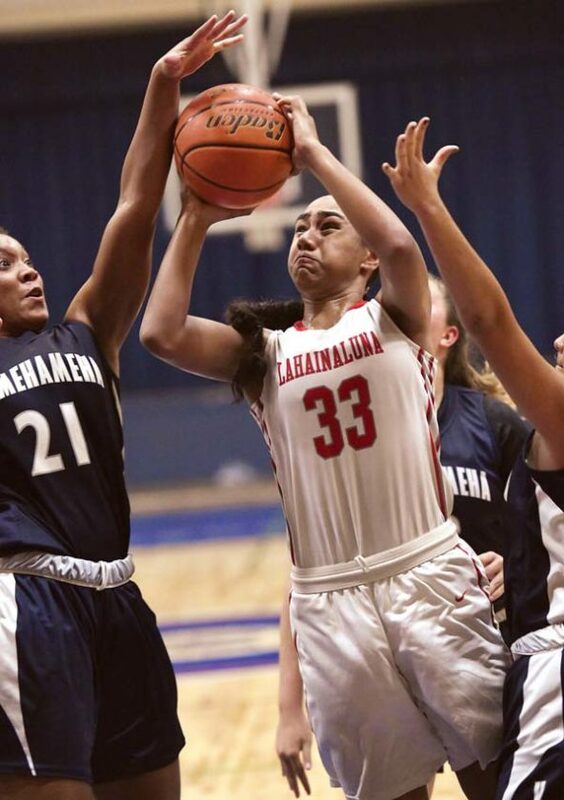 Lahainaluna will open as a seeded league champion in the Snapple Hawaii State Championships on Thursday on Oahu. Namoa, a 5-foot-8 forward, battled inside all night against Kamehameha bigs Kimani Fernandez-Roy and Angel Pauole. The Lunas opened a 13-2 lead after a 6-0 run that included four points from Namoa. A long 3-pointer by Estabillo and a drive through the lane by Balagso to beat the buzzer made it 18-6 at the end of the first quarter. A jumper by Namoa and a 3-pointer by Estabillo to open the second quarter pushed the lead to 23-6. A 3-pointer by Pahukoa followed by two Namoa free throws made it 30-10. After the Warriors pulled within 33-19, Namoa scored inside off a nifty pass from Kaneaiakala. Kaneaiakala sank a runner down the lane with 1:09 left in the third quarter to increase the lead to 37-21 — moments later Aotaki swished home a 3-pointer after a steal to give the Lunas a 40-21 advantage. Aotaki made another trey at the third-quarter buzzer after a pass from Balagso to make it 43-21 going to the fourth quarter — the Warriors did not get closer than 19 the rest of the way. Ashley Taylor Peralta led Kamehameha Maui (8-6) with 12 points. Kamehameha Maui will host a state tournament first-round game Monday against a team yet to be determined. Siena Poepoe 0, Kealia Sjostrand 0, Jamielee Felipe 0, Chasey Koomoa-Sidney 0, Brylee Carillo 2, Shaylisse Gregory 0, Tatiana Soon 0, Kayla Yamashita 0, Logan Spencer 0, Kimani Fernandez-Roy 5, Mikiala Sniffen 0, Kaylee Cambra 4, Ashley Taylor Peralta 12, Angel Pauole 5, Tatiana Martinez 0. Teani Buenconsejo 0, Rachael Balagso 9, Braeanna Estabillo 6, Keiko Aotaki 9, Kayjan Pahukoa 5, Maalaea Kaneaiakala 4, Erin Hookano 0, Kreyajan Pahukoa 0, Abigail Akamine 0, Tcleen Pahukoa 0, Tori Tihada 3, Sheilaika Agbayani 0, Teani Rickard 0, Susitina Namoa 14, Ashley Akamine 0.